Supply your cafe, bakery, or restaurant with the appropriate mixing tool using this thick wire 14" stainless steel French whisk. Constructed from fully soldered, 18/8 stainless steel, it is sure to stand up to the demands of a busy commercial kitchen! In comparison to traditional piano whisks, this French whisk features a longer, narrower design with thicker wires in the whip section. the whisk does its job, i use this for almost everything in my boba store and i would totally buy this again if i need it. I love this whisk. Its actually a really nice to have a whisk thats not to short or tall. I love that its stainless steel and durable. Its also easy to clean. This whisk is very durable and won’t get bent or tangled. Great for whipping up eggs or batter. A bit on the heavy side but that is just an effect of such a durable product. This is an incredibly sturdy whisk! The tines are quite thick and intertwined such that they can't be bent out of shape. I highly recommend it. This is just a perfect medium sized whisk with french tip. Very durable product for great price will be great in any kitchen. You will love it! I got two of the 14” whisks. They are very well made. No more bent whisks for me. They are quite large so I will probably order a couple of the smaller sizes but these are amazing quality. A fresh whisk is perfect for eggs and other think sauces or batter. The stainless steel design allows for easy cleanup. The whisk is also dishwasher safe. The 14" size works well with various size bowls. I don’t know how Webstaurant makes these whisks so affordable, but I’m glad they do. The French whisks are made of a thick construction, so they’re perfect for large batches. Really solid whisk here with this product. Great construction so that it is as sturdy as it is classy looking. I use this product almost daily! This is a very heavy duty and durable whisk. Stainless steel, long handle, and thick wires. It is a bit large for home use but would be great in a commercial kitchen. This is the perfect whip for making soups or things that come in a lager batch because of the longer handle you won't burn your self! You can feel the quality of this whisk as soon as you pick it up. It is a heavy duty whisk, unlike many others out there, A fourteen inch whisk is a longer whisk than most. I highly recommend this 14" Stainless Steel French Whisk. Really good for whipping egg whites, mousses, whipping cream and custards. I will definitely purchase this whisk again. These whisks from webstaurant are great. The stainless steel ensures they'll last you for ages, they're easy to clean, and I like how the design prevents food from getting stuck. This 14" Stainless Steel French Whip has very stiff wires that almost come to a point at the top. This helps get all around the bottom of a pot when cooking and stirring sauces. The fourteen inch Stainless Steel French Whip is perfect for medium stock pots and some larger sauce pans. I frequently use it for mixing in my large stainless steel five to ten gallon mixing bowls. The handle is heavier than I expected but not too heavy it is difficult to handle. I appreciate the possibly unintentional ergonomic design. I would recommend for any kitchen. The 14" Stainless Steel French Whip is excellent. The quality definitely exceeded my expectations. It works great and will not get lost because of its size in my Kitchenaid bowl. I definitely recommend this whip. Great value! Very durable whip that can be used many times over without the concern of it bending or being destroyed. The handle feels very sturdy and holds up over time. A large whip that I use while cooking my caramel sauce on the stove. I love the extra length so my hand does not get so warm while constantly stirring on the cooktop. Helps me make the perfect caramel sauce every time. This is the perfect size for pancake mixing. We use these for other things but the french whip is the way to go as the whisks last longer. I abuse my kitchen tools so i need really sturdy equipment that will last. these whips have really solid construction and can take a beating at a really great price. We use these whisks for our pastry business and they perform extremely well! Very well made and the wires are extremely strong for repetitive use and high volume production. Strongly reccomend this product. Very solid whisk. We this very heavier batters and sauces. I'm not sure these would be very effective with light whipping due to the heavy build quality which is a good thing. This french whip is great quality. The handle is comfortable and the stainless body is sturdy. It's great for mixing up sauces, roux, and much more! Nice strong sturdy 14 inch stainless whip. Perfect for our task in the restaurant and at home. No worries about rusting. Great heavy handle and well built. Excellent Quality. By far the best price on the market. As low as half the cost of other retailers online and locally. Great for thick and thin sauces/yogurts. This is a great heavy duty whisk that is good for mixing things like cornbread mix, pancake mix, and mashed potatoes. Easy to rinse off or throw in the dishwasher. Five stars for both quality and for cost. I could not believe how sturdy and comfortable this french whip is to use while mixing ingredients. I have paid many times this price for whips that are far from this quality. You will not be let down if you purchase this item. Very heavy duty. The wires are thick and sturdy. Hefty handle. Would be even better with a loop for hanging, but I just hang it from the wire side. We love these French whips. This is a heavy duty whip. I use it to mix the salad dressings in a gallon jar and it works perfectly. I am very impressed with this 14" whip it stirs gravy perfect. Removes all clumps with ease and is very well built with a great price. Works great, highly recommend. We use this to make sauces and it's big enough that your hand does not get burned from boiling sauce spray. The quality of this whisk/whip is really great. It is sturdy and strong and works great for whatever you might need it for. The price is unbeatable for the quality you receive. This is one heavy duty whisk I can highly recommend. We use these to mix together battery for our famous glutenfree Brownies. Very easy to clean! 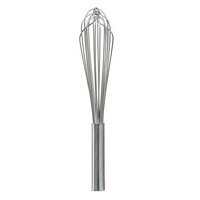 This whisk is a favorite of mine - it's great for use over heat due to its length. It's also very sturdy and strong and will last a long time! I bought this whisk to use to mix thing I don't want to use my kitchen aid for. it will handle the weight of the heavy mixing. This is the largest and most sturdy whip I have used. Used it to make brownies, will be skipping the hand mixer now. Well made. this 14" French whip is very sturdy. It was bigger than I thought of what I wanted to do with it. Overall, good product for the price. What can I say? It is a well built whisk at a great price. One upgrade would be for it to have a hook to hang it, but I just hang it from the whip end and that works okay. A no frills french whip. Good for whipping more spuds or heavier items vs the piano wire whisks that are more fragile. A real good price as well. This is a long whip that works well for stirring dairy in a large pot for making ice cream. Easy to use and well built. Strong material holds up to thick mixtures. The 14" French Whip is great. i love using it to whip up diffrent batters. It is so much easier to use, and easy to clean. The price is great. Nice large sized french whip!! Great for beating egg whites!! Fantastic price! Easy to clean!!! Good for making homemade whipped cream too!! Worth every penny!